We supply an excellence Roof Corner Flashing Sheet which is appreciated for its durability and quality. This is a thin sheet made of metal or nonmetal material and used in domestic and commercial buildings to prevent entry of water through joints. We supply them with quality materials which are unbreakable and free maintenance.We offer these corner flashing which are made by using high grade raw material source from prestigious suppliers. 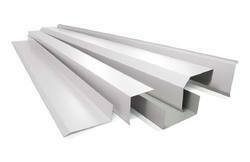 We are the leading manufacturers of Metal Roof Flashing. Looking for Roof Corner Flashing Sheet ?